This is another new striking Art Deco bathroom. 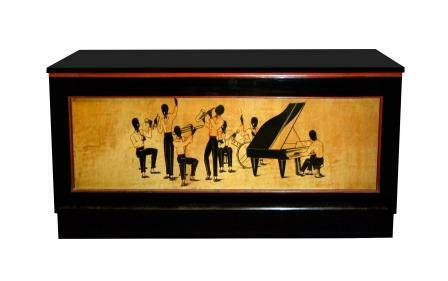 The black painted border frames the wonderful central panel designs. 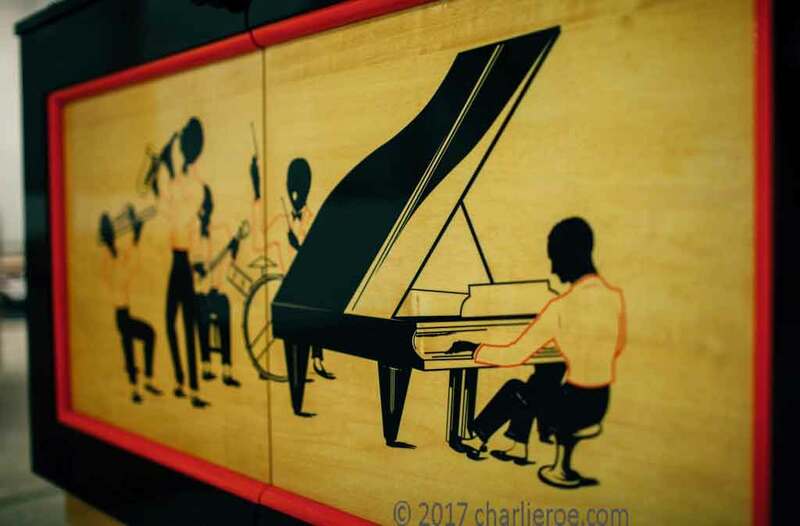 These designs, on a wood background, show silhouettes of a Jazz band. 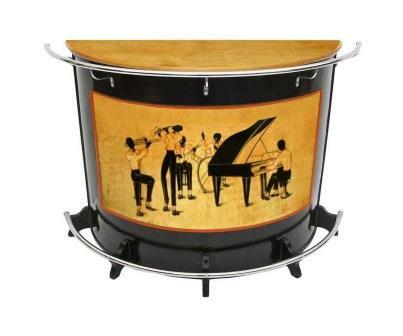 The figures were inspired by an early South American Deco bar, but adapt wonderfully to other uses. 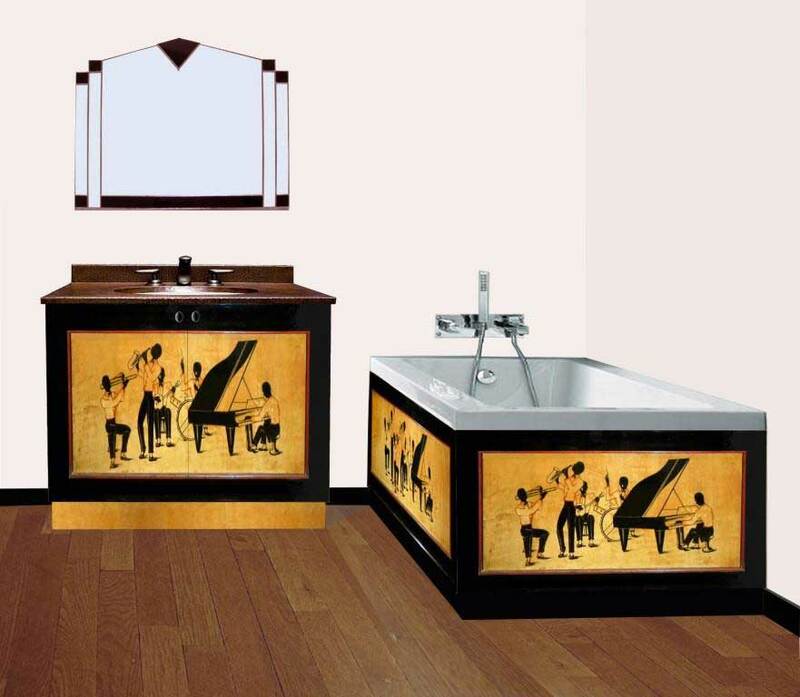 Here they've been used on both the vanity unit & bath panels to create a very Jazzy feeling bathroom. 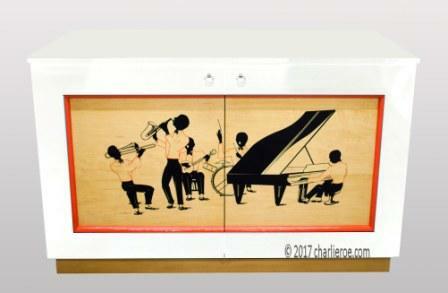 The designs on the panels can be varied for more interest. This is a really original take on Art Deco bathroom design. While shown on a wood floor here, a tiled floor would have totally changed the look of this bathroom. The boxy shape of the Vanity unit is typical of Deco styling. 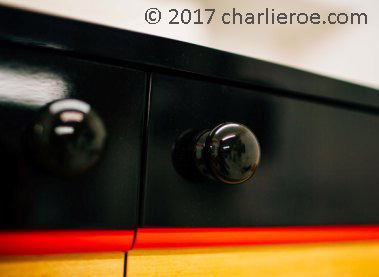 The black gloss lacquered carcase & door rails add drama, with the panel mouldings picked out in red for max. contrast. 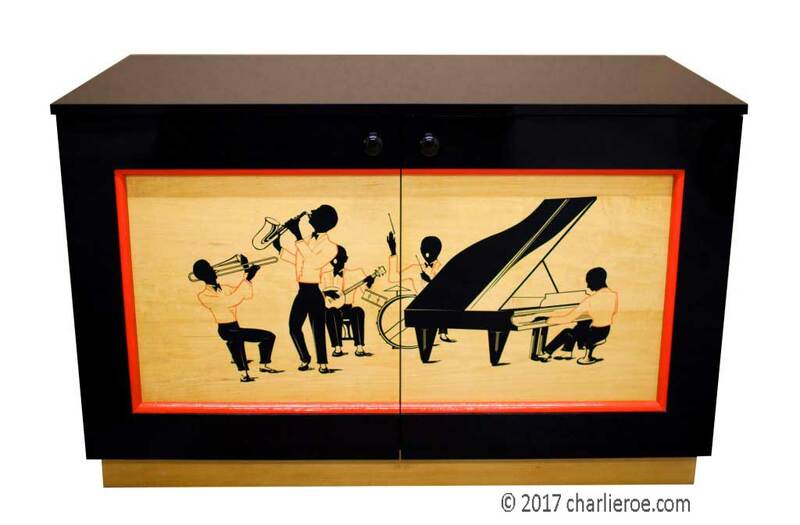 The maple colour panels contrast excellently against the black to highlite the figures perfectly. 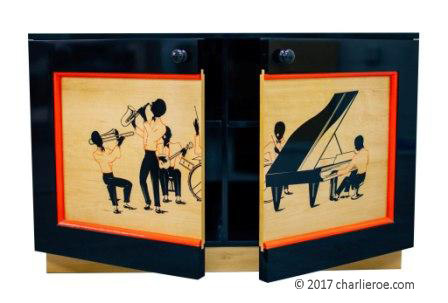 We could change the panel wood if you prefer, and even the vanity carcase colour, as made to order. Internally the vanity is fitted with 1 shelf. The worktop/sink/tap combination shown here can be changed to whatever you want; worktops can be granite, marble, modern quartz stone, Corian, glass, wood, metal, etc etc. Sinks can be undermounted or sit-on. Emphasise the Deco look bathroom with one of our Deco plaster cornices, or a jazzy stained glass window. You can change the proportions if preferred, as shown above, as this is made to order. You can play around with the design of such pieces endlessly, from proportions to plinth colour. You could even have a His n Hers double vanity unit. You could also have a small upstand at the back of the worktop. As made to order we don't give out sizes or quotes until we've agreed a spec with a customer. Shown above LH is a small home bar, semi-circular shape, complete with chrome rails. This shows how we can adapt a design in many ways to achieve the look you want. 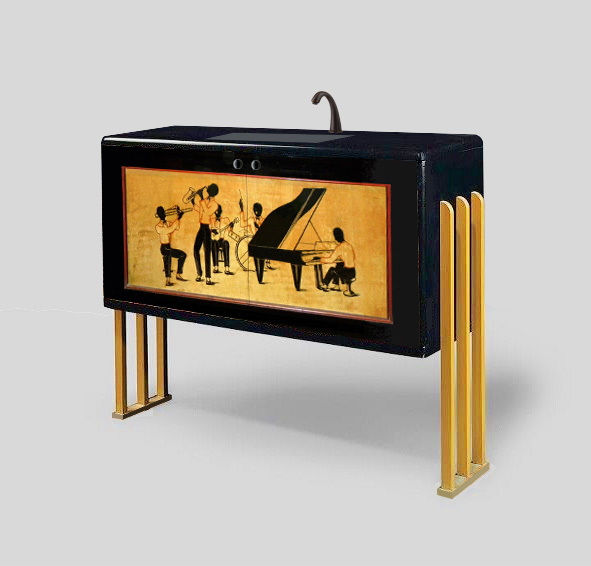 This is one of those fun pieces that creates an authentic Deco look in a room. Fitted with shelves on the reverse side. Made to order - sizes are agreed with each order / client. Shown above RH is a more striking version of the vanity unit, and would look dramatic in any Deco bathroom. 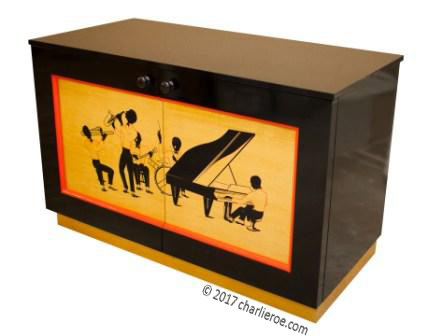 The cabinet & legs arrangement were inspired by a Jean Dunand cabinet, and makes a stunning Deco statement in a bathroom. The height could be varied depending on the type of sink you want to use. 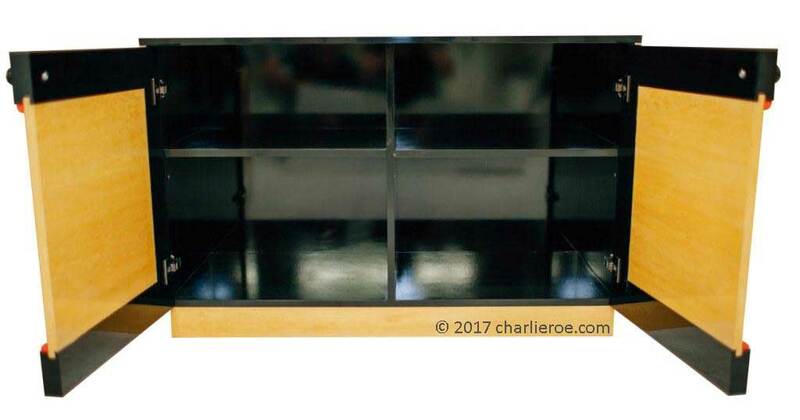 Below; the cabinet doesn't need to be black, we've shown it in a white finish as well. Made to order.